Children are like this, born scientists. They raise unique and interesting hypotheses: have creative ideas, ask curious questions, and want to unveil the world. Kindergarten classes meet these desires. We plan and carry out everyday activities in a way that encourages seeking, experiencing and finding. 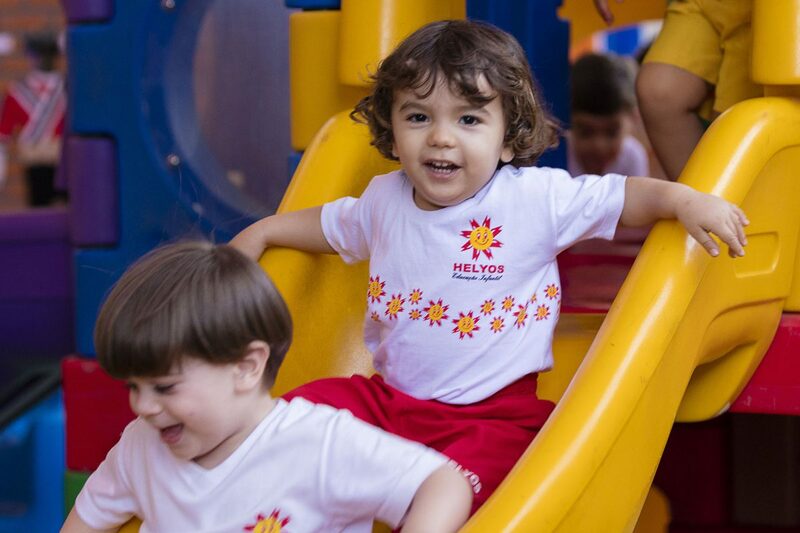 In the context of school, playfulness is fundamental. 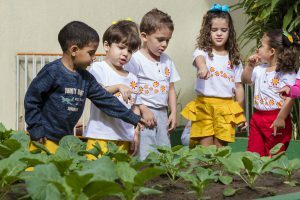 Participating in group fun and games on the playgrounds and in the classrooms, gyms and recreation rooms, children develop interactive skills in how to get along with each other, cooperate, and be self-confident and autonomous. Children also participate in music classes where they play with sounds. 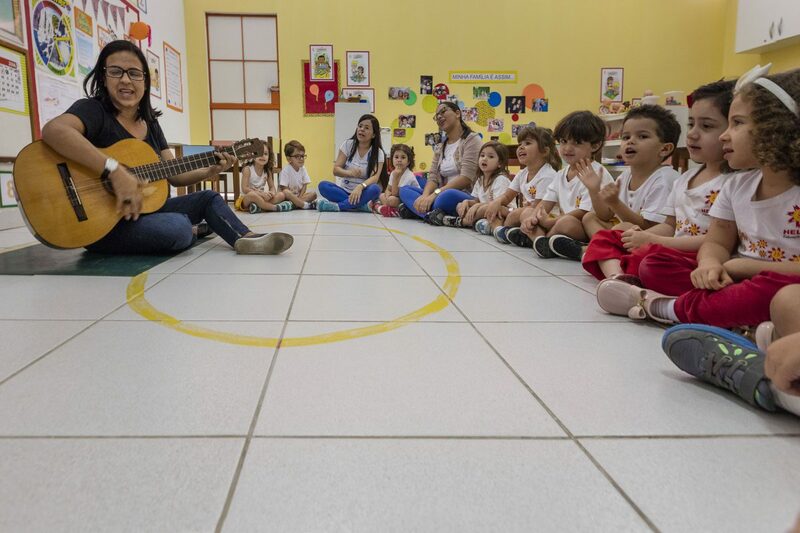 They use musical instruments and get to know their similarities and differences by imitating, inventing, singing and dancing. 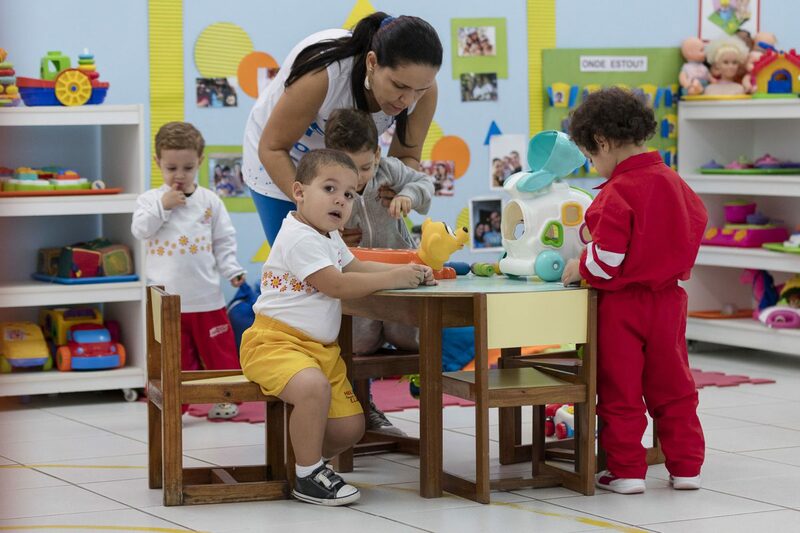 Visual arts, another very significant activity, happens every day in our classes. 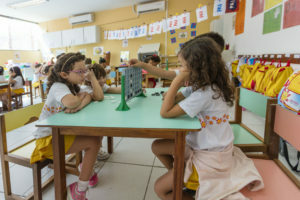 Teachers provide a wide range of materials and techniques for children to feel motivated to create. By scribbling, drawing, painting, cutting and pasting, they increase their perception, sensitivity and imagination. 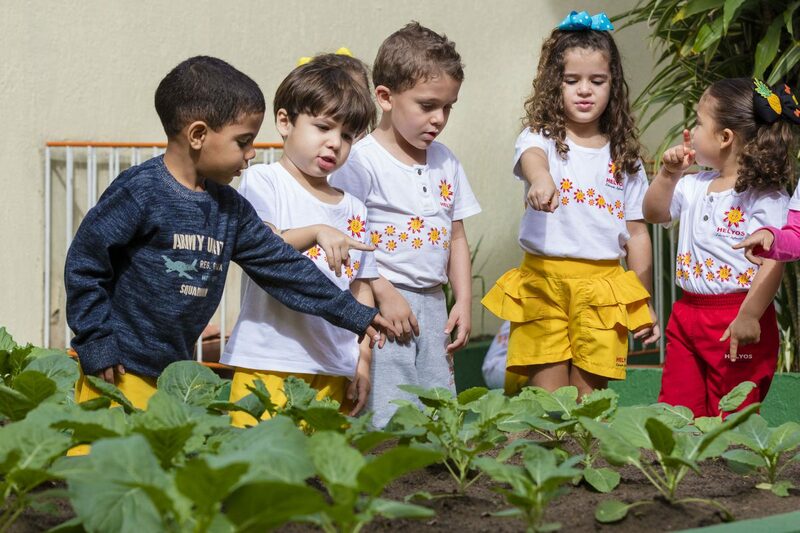 Talking circles take place in specific project contexts such as, when students plan the preparation of planting and harvesting in the vegetable garden, which provides the ingredients for the delicious natural sandwiches that they make. Talking circles are a time to discuss food and health. By telling and retelling stories from different perspectives, worldviews are widened which awakens students to life’s various possibilities. Personal style, group agreements and caring for others are topics that are discussed, and form the foundation of a respectful and pleasant group experience. In the talking circle, with all sitting and listening to what the others have to say, the groundwork for socialization develops harmoniously. 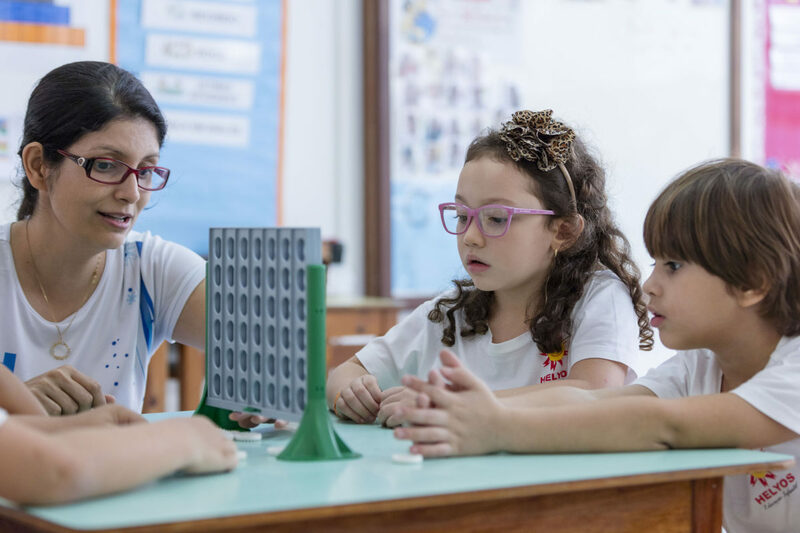 Basic math concepts such as counting, spatial relationships, solving problems and doing challenges are presented, with fun materials not only for the group, but also for students in a more individualized way. Students learn the elements of logic in Brain Games classes, where they must understand rules and formulate successful strategies, developing essential skills for modern life. 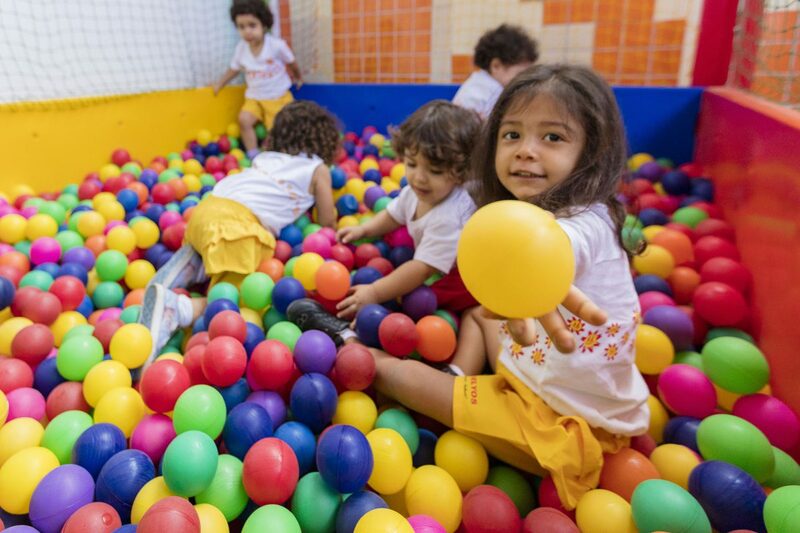 Thus, in a well thought out environment filled with inviting and pleasant stimuli, children happily develop their physical and intellectual potential.